How deep should a Kiln Sitter Tube go into a kiln? How do you adjust the depth? The Kiln Sitter Tube assembly should stick into the kiln about 1". This will allow air to circulate around the cone and allow it to have a more accurate representation of the kiln temperature. 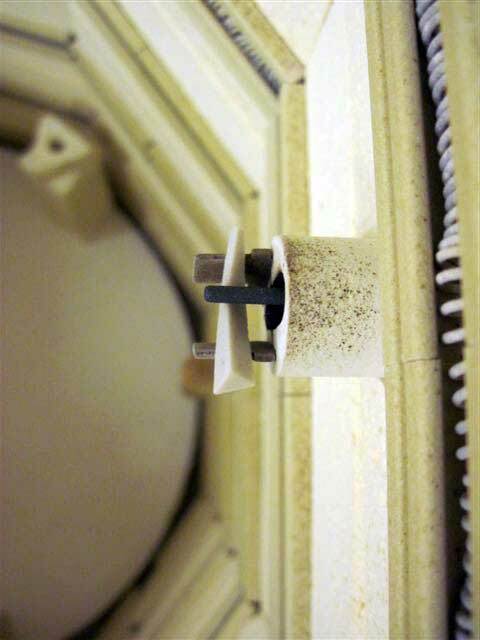 We typically provide either two or three 1/2" ceramic spacers between the Kiln Sitter and the kiln. This allows for adjustment of the depth of the Kiln Sitter Tube Assembly. With the Jupiter kilns, when packed, the Kiln sitter is attached to the panel which is packed separately from the kiln body. We drill the hole in the kiln body and predrill the 4 screw holes for mounting the kiln sitter to the kiln section. We provide the spacers and mounting screws and the customer is responsible for mounting the kiln sitter. There is a slight difference between an Orton Kiln Sitter and a Dawson Kiln sitter tube length with the Orton being slightly shorter. Therefore it is possible, if using the three 1/2" spacers that we would normally use on a Dawson Kiln Sitter, that the tube would not be at the proper depth in the kiln. The Orton would require either one or two 1/2" spacers as follows. One 1/2" spacer on a 3" wall kiln and two 1/2" spacers on the 2 1/2" wall kiln.